Serving the San Francisco EastBay Area. 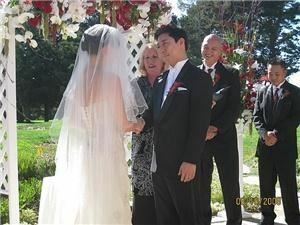 I provide wedding ceremony services that fit your personal style. I have ceremonies for all budget levels. I help you create a ceremony that reflects the two of you and your ideas of your marriage to share with your family and friends. I help you create your dream ceremony. Deposit is non refundable. In the event of cancellation you will have one year from that date of cancelation to apply apply monies toward a new date. Booking is subject to available open dates and times Rehearsal is available for additional fee of $150.00 Travel outside of service area is subject to additional fees.